Melbourne punk outfit, Constant Mongrel, released their DCM 7″ on R.I.P. Society Records, and from the record came The Law, a grinding and gnashing mouthful of distorted, unapologetic punk rock. The music video for The Law follows much of the Do-It-Yourself, homemade video aesthetic, which over the years has been adopted by both popular and underground acts alike. Look no further than the hilarious mash-up of Twin Peaks horror and B Movie Slasher films in Mac Demarco’s Passing Out The Pieces, or Earl Sweatshirt’s disturbing, snuff-influenced video for his own self-titled anthem, EARL – both videos tend to feel way too real in their blurry, jaded home video presentation, often leaving us humoured, confused and even repulsed (especially in the case of EARL – no one can deny that this video churned up at least some degree of disgust in our stomachs; It was messed up, MESSED UP). It’s this homemade, bedroom aesthetic that has given a lot of music videos an amusing and pleasantly unpleasant relate-ability that has felt real and true to the artist’s intentions, without the visions and demands of outsiders intervening. 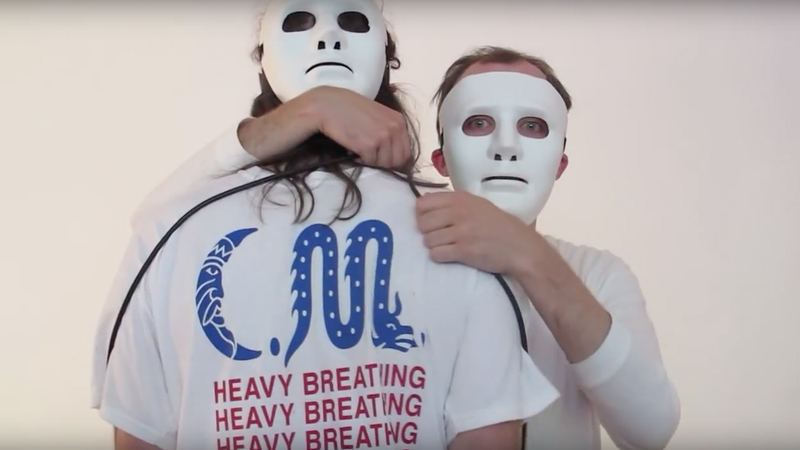 In Constant Mongrel’s music video for The Law, the band films themselves in minimalist, rustic white-walled rooms, waving around hammers and bicycle wheels, as well as the now not-so-forgotten gems such as video players and box televisions. These characters perform tainted and ill-at-ease dance routines whilst wearing white and black face masks, strumming air guitars and dangling amp leads, almost suggesting their surrounding space to be a sort of Shutter Island mental asylum experiment, where, unable to look away, we watch the insanity unfold from behind a one-way mirror; this out-of-control and hypnotic picture of Mongrel is only made more hilarious by the fact that the band members keep cold, hard eye contact with the camera throughout the entire video. With The Law, Mongrel also seem to snidely allude to the internet vigilante group, Anonymous, with the use of these non-descript face masks – not dissimilarly to the hacktivists, Mongrel are seen here creating their own slice of havoc behind closed doors, unseen and faceless to the average passerby, yet utterly dangerous for anyone unlucky enough to become their target. Mongrel’s music video for The Law is absurd and hilarious, managing to effortlessly portray some downright madness, underscored by the song’s sneering, hyperactive punk; it’s the un-co dance strides, invisible instruments and hammers though, that really make Mongrel’s contained rowdiness a very funny thing to watch.